Generic Tautomerization Forming an Enol. Keto-form at left, enol at right. The α-hydrogen (H) deprotonated in the common base-catalysed reaction is indicated. R3=H, aldehyde case; R3=alkyl, ketone case; etc.. Groups R1 and R2 may be a variety of structures that influence the equilibrium, including alkyl, carbonyl-containing (for stabilized enols), and hydroxyl groups (in enediols). Ketone tautomerization, keto-form at left, enol at right. Ex. is 3-pentanone, a less stabilized enol. Enols, or more formally, alkenols, are a type of reactive structure or alkene (olefin) with a hydroxyl group attached to one end of the alkene double bond. The terms enol and alkenol are portmanteaus deriving from "-ene"/"alkene" and the "-ol" suffix indicating the hydroxyl group of alcohols, dropping the terminal "-e" of the first term. Generation of enols often involves removal of a hydrogen adjacent (α-) to the carbonyl group—i.e., deprotonation, its removal as a proton, H+. When this proton is not returned at the end of the stepwise process, the result is an anion termed an enolate (see images at right). The enolate structures shown are schematic; a more modern representation considers the molecular orbitals that are formed and occupied by electrons in the enolate. Similarly, generation of the enol often is accompanied by "trapping" or masking of the hydroxy group as an ether, such as a silyl enol ether. Critically, the terminus of the double bond in enols, enolates, and silyl enol ethers that lacks the hydroxyl group is aldol and related reactions). The importance of enols in accomplishing nature and humankind's chemical transformations makes them irreplaceable. The process to form enols and related structures requires at least one hydrogen atom on a carbon adjacent to a organic compounds, involving interconversion via formal migration of a hydrogen atom accompanied by switch of adjacent single and double bonds, in this case, the hydrogen atom in the position immediately adjacent (α-) to the carbonyl group, as was shown and discussed above. The types and sizes of the substituents in the vicinity of the enol and enolate (e.g., R1, R2, and R3 in the image above), and the particulars of reaction solvent, additives, and temperature contribute to the stability of the enol-type chemical syntheses the same control is increasingly being achieved by man. Likewise, more complex substituents contribute to further unique reactivities, such as in enediols, alkenes with two hydroxyl groups, one on each end of the double bond, which appear in such structures as that of vitamin C, and contribute to its important redox properties. esters, ketones, and aldehydes—often display such an equilibrium. The examples of the 3-pentanone and 2,4-pentanedione tautomerization equilibrium appear in the gallery of images above. In the case of ketones, it is formally called a keto-enol tautomerism, though this name is often more generally applied to all such tautomerizations. Malondialdehyde (propanedial) enolization. An example of a 1,3-dicarbonyl compound whose enol is stabilized by hydrogen bonding, leading to detection of a percent or less of the keto form at equilibrium. In 1,3-dicarbonyl compounds—see the examples of 2,4-pentanedione and tartronaldehyde in the opening image gallery—that is, when two carbonyl groups are separated in the structure by a single methylene- or methine-type (-CHR-) group [i.e., have the structure -C(O)-CHR-C(O)-, where R=H, alkyl, or other groups]. Hence, while one α-hydrogen is required (see opening image gallery), the second substituent in the α-position may be variable. Enol stabilization is due in large part to the intramolecular hydrogen bonding that is available to it, as shown for the 2,4-pentanedione equilibrium above. In the case of malonaldehyde (propanedial), over 99 mole% of the compound is in the enol form. While lower for 3-ketoaldehydes and 1,3-diketones, the enol form still predominates, e.g., in the case of 2,4-pentanedione, a 1,3-diketone, 80 mol% is in the enol form. When keto-enol tautomerism occurs the keto or enol is deprotonated and an anion, which is called the enolate, is formed as intermediate. Enolates can exist in quantitative amounts in strictly Brønsted acid free conditions, since they are generally very basic. In enolates the anionic charge is delocalized over the oxygen and the carbon. Enolate forms can be stabilized by this delocalization of the charge over three atoms. In valence bond theory, the enolate structure and stability is explained by a phenomenon known as resonance. 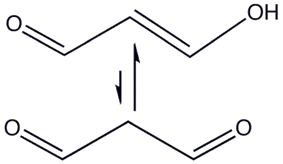 The two resonance structures shown here constitute the resonance hybrid. 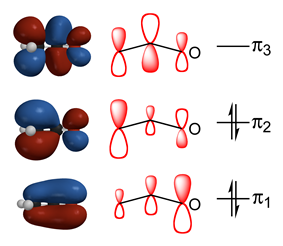 In molecular orbital theory, it is represented by three delocalized molecular orbitals, two of them filled. In ketones with α-hydrogens on both sides of the carbonyl carbon, selectivity of deprotonation may be achieved to generate two different enolate structures. At low temperatures (-78 °C, i.e. dry ice bath), in aprotic solvents, and with bulky non-equilibrating bases (e.g. LDA) the "kinetic" proton may be removed. The "kinetic" proton is the one which is sterically most accessible. Under thermodynamic conditions (higher temperatures, weak base, and protic solvent) equilibrium is established between the ketone and the two possible enolates, the enolate favoured is termed the "thermodynamic" enolate and is favoured because of its lower energy level than the other possible enolate. Thus, by choosing the optimal conditions to generate an enolate, one can increase the yield of the desired product while minimizing formation of undesired products. Enediols are alkenes with a hydroxyl group on both sides of the C=C double bond. Enediols are reaction intermediates in the Lobry-de Bruyn-van Ekenstein transformation. Enediols with a carbonyl group adjacent to the enediol group are called reductones. The enediol structure is stabilized by the resonance resulting from the tautomerism with the adjacent carbonyl. Therefore, the chemical equilibrium produces mainly the enediol form rather than the keto form. Reductones are strong reducing agents, thus efficacious antioxidants, and fairly strong acids. Examples of reductones are tartronaldehyde, reductic acid and ascorbic acid. ^ Douglass F. Taber, 2015, "Synthesis of silyl enol ethers and related compounds," Organic Chemistry Portal (online), Reactions, Organic Synthesis Search, Categories, O-Si Bond Formation, see [www.organic-chemistry.org/synthesis/O1Si/silylenolethers.shtm], accessed 16 July 2015. ^ IUPAC, Compendium of Chemical Terminology, 2nd ed. (the "Gold Book") (1997). Online corrected version: (2006–) "Enolates". ^ IUPAC, Compendium of Chemical Terminology, 2nd ed. (the "Gold Book") (1997). Online corrected version: (2006–) "reductones".